So now feeling somewhat outnumbered, we four made our plans for the weekend which included abandoning our trip up Paradise Valley given the suspect avalanche conditions. 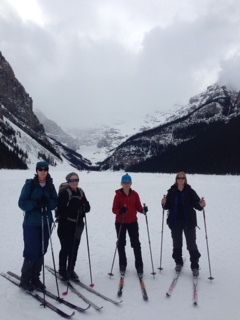 After a check at the Information Center in Lake Louise on Saturday we settled on Fairview Loop, lunch in the Chateau and on a tour on Lake Louise to the frozen waterfall. Ski conditions were good and the day uneventful for us anyway. We did come across foreign folks who thought the ski track was a short cut out of the Chateau parking lot and managed to get their Honda CRV buried to the front axle right at the foot of the track down off Fairview Loop. A quick snow plow was necessary there. Then out on the lake another group of foreign folk thought it was hilarious when one of their senior ladies plunged one leg through the ice up to her hip. They were still doubled up with laughter as she trudged off toward the parking lot wringing out her sock. They should have seen the signs when the top of the hockey nets were protruding eight inches out of the ice. By that the time the rain was beginning to fall so we wondered of our chances for a good ski the next day. As luck would have it, the rain turned to heavy snow. Back at the hostel as we ate a great potluck supper tucked behind the wood stove (seeking quiet from the aged girl guides who were still at it). Tony joined us and chatted our ears off of events in the Bow Valley. Sunday we made tracks for Pipestone Trails and had a great ski on the fresh snow. Judy and Linda were hard for Dianne and Marilyn to catch as they ripped up the trails. The sun eventually turned the snow soggy late in the day as we were on the downward run, but had a great ski never-the-less. So all in all Paradise Lost, but paradise regained in the leisurely tempo of the weekend and terrific camaraderie thanks to Marilyn and Linda.